Welcome to the Lar de Vilariño a small rural hotel where we have put all our enthusiasm and effort to make your stay as pleasant as possible. 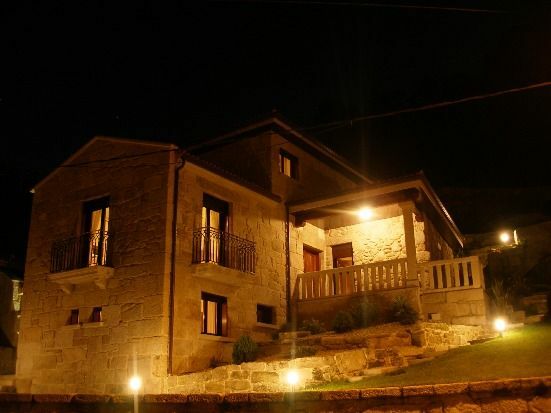 The rural house Lar de Vilariño is located in the heart of the region of Pontevedra, in the town hall of Poio, located on the slopes of Monte de la Escusa. The original house has an antiquity before the eighteenth century, a deep restoration was made trying to preserve the original structure and respect the traditional architecture of the old stonemasons combining it with new construction techniques. We hope that your stay among us, enjoy our mountains, our beaches of our artistic, cultural, landscape and above all the hospitality and kindness of our people who will make your visit to Galicia is a see you soon. Lar de Vilariño has: - 5 Rooms with double bed. - All rooms have a full bathroom, television and telephone. - Interior facilities: dining room, living room, TV, full kitchen, meeting room and interior patio. - Outdoor facilities: parking, terrace, garden and pool.